Ok ok, an article about the laptop fiasco continues here. I couldn't help it. You now i love joel spolsky... but you can drive a truck through two bloopers in his latest piece, talking about microsoft sending complimentary laptops to bloggers. Corrupting the medium?? What happened to the real Joel? Did alien bugs eat your brain? How on earth could the medium of blogging, in general, be corrupted any further by this particular incident? ...or was I hallucinating all those things? And there seems to be a lot of this chest-beating and pontificating going on in the blogosphere as people shout their indignance at the very thought that other people should be receiving gifts. 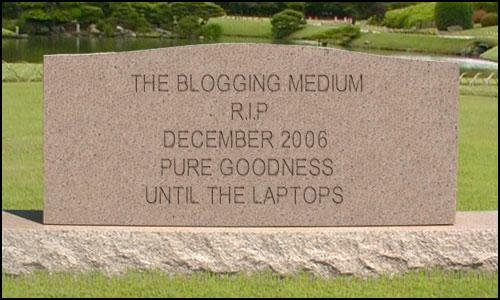 it's up to the blogger what they blog, and it's up to the reader what they read. should you accept it? if you can give it a thorough review, yes. should you look hard for flaws? in all cases, yes plus! Sure, it's good when a site has an up-front policy, such as that provided by the Daily Grind -- but i'd only consider this to be necessary for a site that, like the Daily Grind, purports to be objective. In a case like that I'd say the author has clearly exceeded the usual definition of a blog. "Bloggers tend to make things into a bigger deal than they need to be."